Fringe knotting is a technique used to both tie off and finish the ends of a piece of fabric. This technique works well for shawls and scarves where the fringe is used to add to the decorative quality of the piece. Creating a knotted fringe is a simple, if time-consuming, process. Once you understand the technique, you will be able to add fringe to any fabric garment or piece that you feel would benefit from fringe. Place fabric on your worktable. Measure the length you want with the fringe included for your scarf. Add two inches. Measure with the grain of your fabric so that the sides of your scarf are parallel with the selvage of the fabric. Measure the width you want and add one-half inch for hems. Cut your fabric to size. Measure the length of your fringe from one end edge. Add 1 inch. Sew a seam straight across the fabric. Repeat for the other end edge. Sew a tight double-folded hem between your seams on each side. Place your fabric so that the cross-seam of one fringed edge is even with the edge of the table. Position tape across the width of the fabric taping the scarf securely to the table. Lift the fringe fabric area. Use a seam ripper to gently separate the weft, or horizontal, threads from the warp, or vertical, threads. 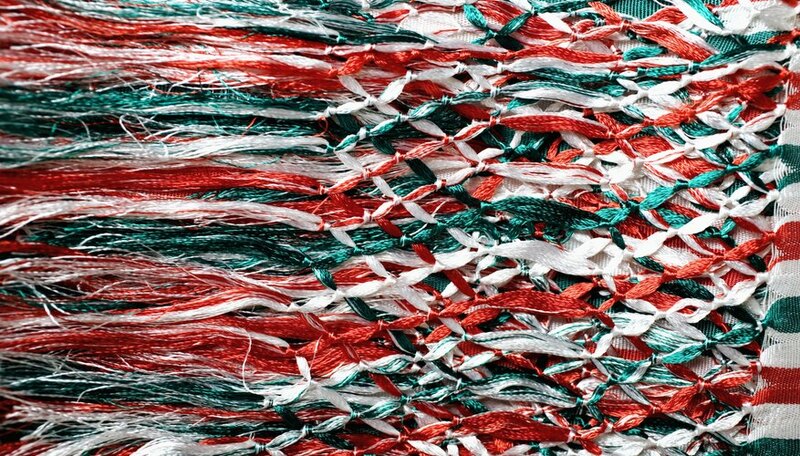 Your warp threads will be your fringe threads. Pull the weft threads away with the tool and your fingers until you reach your seam. Remove the tape. Turn the fabric around and repeat. Count your warp threads and divide evenly from any number from two to five. Gather two adjacent groups of your number of threads and tie them into an overhand knot. Move to the next threads and repeat across your scarf. For a second row, divide half of your end group and half of the adjacent group and knot. Allow the end half to extend down. For a third row, pick up your unused half of the original first group and add it to half of the adjacent group. This will create a lacy effect. Make your knots as long as you wish on each side. You can add beads to your fringe by threading beads onto the threads during the lace weave or knotted to the bottom of the fringe.